Hot air ballooning is a unique experience enabling you to gently rise from the ground, travelling by a gentle breeze above the landscape, discovering from a bird's-eye view the beauty and attractions that make up the Gold Coast Hinterlands. 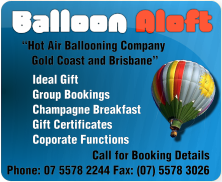 Our hot air balloon rides make for fantastic gifts, open dated gift vouchers, for every occasion from birthdays to romantic surprises. We have teamed up with a number of other businesses on the Gold Coast to assemble a great range of seasonal packages to offer.